Mind Your Step. Simple advice that saves lives. One misstep is all it takes to walk into the path of danger or sustain injuries. Physical missteps have sent me tumbling off a ladder; sliding down a cliff; treading in wet cement; tracking wet paint across a wooden floor; encountering a rattlesnake; falling on ice; plummeting into cold water; getting trampled by a runaway horse; tearing a muscle in my thigh; breaking my ankle; getting lost. Health and safety regulations abound in an attempt to prevent misstep injuries. Ladders carry warnings not to stand on the top step. Barriers are built along drop-offs on mountain roads and paths. Workers erect signs to warn pedestrians away from paint and wet cement. Emergency radios broadcast ice warnings. Signs along wildlife areas warn to watch for snakes. Missteps still happen, but warning signs and barriers frequently save lives and prevent injury. Mind Your Step warnings seem incapable of keeping me from getting lost. When the paint dries, when the cement sets – physical Mind Your Step signs come down. 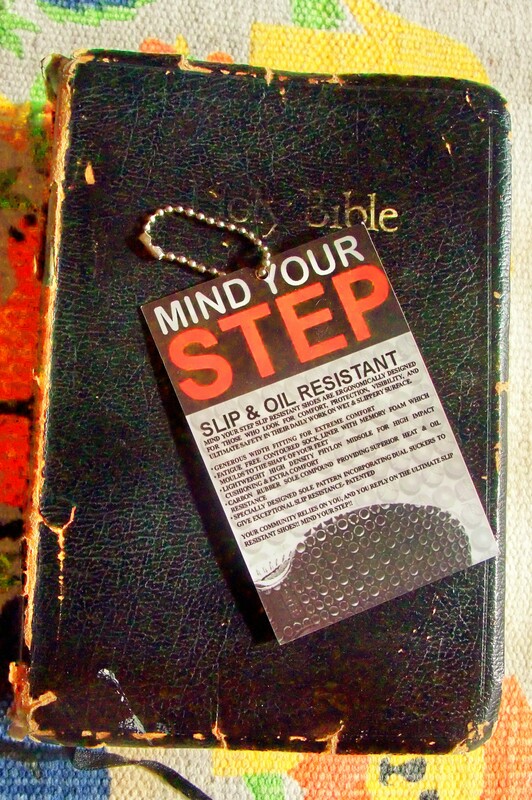 Spiritual Mind Your Step signs have no expiration date. Psalm 37 states, “The steps of a good person are ordered by the LORD and the LORD delights in that person’s path…none of their steps shall slide.” When we keep in step with God, He keeps us from falling down or getting lost in the chaos of life in this fallen world. He keeps us safe. Our outward circumstances don’t change; we still face the same illness, heartbreak and disappointment – the same trials – as other people. Becoming a Christian doesn’t safeguard against suffering. Becoming a believer installs a coping mechanism. With Jesus living inside us, we have the strength and endurance to get up and keep going every time life knocks us down. The closer we get to God, the less we will care about obtaining physical comforts that stay behind when we die. The less time we will spend comparing ourselves to what other people have and envying those who have more. I worked for a veterinarian. Neither he nor his wife was a believer. They told me they didn’t need God because they had great lives and had done it all themselves without help from God or anyone else. They owned an ostentatious home on the lake and drove pretentious cars. They had the best of everything. He became an alcoholic; she became addicted to gambling. Within four short years, they were divorced and had lost everything. They stood in a slippery place and lost their footing. Next time you see a sign that warns, Mind Your Step, look past the temporary physical danger and contemplate your spiritual safety. Heaven is forever. Posted on August 23, 2014 by authorstephanieparkermckean •	This entry was posted in Uncategorized. Bookmark the permalink.